Alone with nothing to do but drink? Tonight I’m alone in the house. This, my friends, is when I do my best drinking. It’s my favorite time. No one to judge, no one to ask if I really should have another. I turn on a movie and skim the internet, or if I’m feeling particularly productive I’ll learn a new song to karaoke, not that I ever karaoke in public, or I’ll learn a new dance. Yeah, I’m a fun drunk when I’m alone at night with my vodka and mixer. Today is officially two weeks sober. It feels like months and months. Like I have been dry forever. Two weeks is nothing. I cried a lot today. Emotions seemed to be bubbling up to the surface for no good reason. They were waiting there ready to pounce the minute something triggered them. Once Iz left, I let it happen. I let the tears flow. It actually felt good to release all of that emotion. I began to appreciate all of the hard work I have been putting into this whole sobriety thing. Not remember the fights I had while drunk and unsure if I made good points to support my arguments. Worrying about needing to drive somewhere. Wondering what I did for the 5 hours I was drunk. Not that I couldn’t remember, but where did the time go? What do I have to show for it? Except now knowing how to do the Cups song. I’m sure that will serve me well at some point in my life. I will admit to thinking, after Iz walked out the door to barely make his flight in time, that if I had a drink, no one would know. But I didn’t. Instead I sent Iz a text telling him that I had that thought so he would know to check up on me. Instead of a drink. I went for a run. A very hot 3.5 mile run. My pace has been 13 minute miles. I have added 3 minutes to my mile in the last 4 years. That frustrates me. I want to get faster. I also did 20 minutes of yoga thanks to Yoga Today. I love this photo of us take last Sunday. I love it for many reasons. It shows the playful side of us that seems to be showing up to the party more and more. 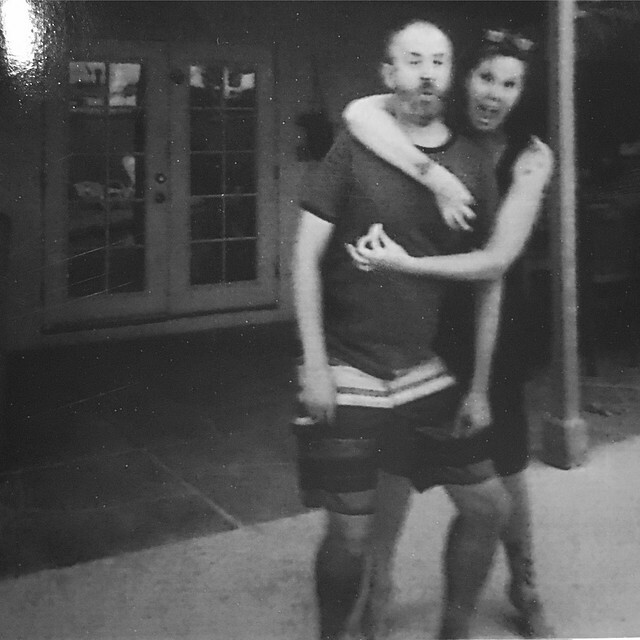 It was taken by Iz’s daughter with her new polaroid camera. I heart kids getting into photography. I also think it shows (ok, being a little shallow here) my physical potential. My arms look like they have muscles!